Fish farming takes several different forms, some more intensive than others. Methods vary in how the fish are held, how the water is managed and the level of feed inputs. A review of the welfare issues in global aquaculture is given in Animal Welfare and Meat Production1. Holding systems include natural water resources e.g. a pond or part of a river, manmade ponds, tanks, concrete raceways and cages. In some systems the water flows through naturally, e.g. floating cages in an estuary or raceways through which water is diverted from a stream. In other systems the water is filtered using biological or mechanical filters and reused. Fertiliser or manure may be added to promote the growth of simple plants and a natural food supply and, in some systems, quantities of supplementary feed are added to the water. Feed often includes fish caught from the wild. The management of the water and levels of fertiliser/feed inputs affect the stocking density of the fish that can be supported. In intensive systems, stocking densities are high, the fish are dependent on feed and water must be replenished at a high rate to maintain oxygen levels and remove waste. 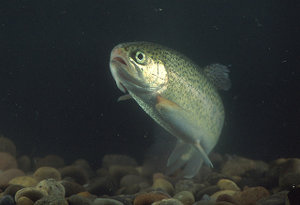 Fish farming in Europe is domionated by the intensive farming of carnivorous fish species, such as salmon and trout, which are highly dependent on feeds made from wild-caught fish. Other environmental stresses (inappropriate temperature/salinity, insufficient hiding places/cover/protection, cage noise). Fish confined in cages or ponds are unable to escape causes of fear and distress, such as low oxygen, cage noise generated in rough weather by the impact of waves and aggression from larger fish which can lead to injury, inability to feed and cannibalism. Crowding fish together encourages the spread of disease and of parasites, which are a common cause of irritation. Sea lice feed on the skin and blood or fish, leading to ulceration, reduced growth and sometimes open wounds on the back of the head. Besides cannibalism and parasites, farmed fish can also be attacked by external predators (such as birds, seals, jellyfish). A study of farmed carp in the EU2 identifies predation as a very serious welfare issue, particularly in the pond environment where cormorants can stress the fish, causing them to reduce feeding, and the birds may also inflict injury. In some types of fish farming, fish such as tilapia are stocked together with predator fish to control numbers. Fish handling procedures, such as transferring fish between pens; grading (separating fish by size); vaccination by injection and chemical treatments to prevent disease/parasites, are further sources of stress which can result in injury that may lead to fatal infection. The welfare problems in the intensive farming of Atlantic salmon, rainbow trout and Atlantic halibut are discussed a report by Compassion in World Farming and the World Society for the Protection of Animals, Closed Waters: The Welfare Of Farmed Atlantic Salmon, Rainbow Trout, Atlantic Cod & Atlantic Halibut3, which also raises concern for the prevalence of cataracts, soft tissue malformations, skeletal abnormalities, pre-slaughter starvation; the impact of confinement on migratory species; of subjecting fish to prolonged periods of artificial light; high mortalities; the welfare of wrasse fish caged with salmon to control lice; predator control measures and the welfare threats from possible increased use of tagging, by selective breeding for fast growth and genetic modification of fish. A similar range of welfare concerns (including water quality, stocking density, disease and parasites, genetic manipulation, handling, transport and inhumane slaughter) are raised in a report by the Humane Society of the United States (HSUS) entitled The Welfare of Animals in the Aquaculture Industry4. In the United States, channel catfish make up over 80% of farmed fish production tonnage (81% in 2010) with most of the rest comprising Atlantic salmon, rainbow trout and tilapias. According to a source cited in the HSUS report, in the U.S. catfish industry mortality due to infectious disease can approach 30% of the population 5. An animal’s internal environment can be harmed not just by the environmental rearing conditions but also by its own genetics – i.e. how the animal has been bred. Fish welfare issues include selective breeding for fast growth, genetically modified transgenic fish and triploid fish. Selective breeding for fast growth has created serious health and welfare for terrestrial farmed animals, and therefore presents the risk of similar welfare problems being developed in farmed fish. The development of transgenic fish genetically modified, for example, to grow faster or to withstand harsh conditions, threatens to develop new welfare problems – two examples of which are given by Gregory 1. Welfare problems in salmon genetically engineered with a growth hormone gene have included impaired immune function, enlarged head and bulging operculum sufficient to cause breathing difficulties in some individuals. Fish genetically engineered for tolerance to salinity could be caused suffering where the gene is under expressed in a proportion of individuals, especially if this results in a slow death. Triploidy is a method of producing sterile fish with three sets of chromosome instead of the usual two, by subjecting newly-fertilised eggs to heat or pressure shock. The breeding of triploid salmon in aquaculture is used for reasons of preventing interbreeding with wild fish if the salmon escape and for improving flesh quality and growth rates, which are impaired by sexual development. Triploids are, however, susceptible to a range of health and welfare problems, including higher levels of spinal deformities, eye cataracts, poorer growth and lower survival rates. Artificial breeding processes can have serious welfare impacts on fish. Many species of farmed carp do not breed naturally in captive conditions and in consequence, it is common practice to induce production of sperm or eggs by injecting hormones. While natural spawning is sometimes allowed for breeding fish, many species are commonly stripped by hand to remove eggs and sperm. Welfare certification schemes, such as the Soil Association, require salmonid broodstock to be anaesthetized or humanely slaughtered before stripping them6 in order to mitigate the welfare impact of removing eggs artificially. Some fish species may be unsuitable for farming. For example, eels are a solitary animal much of their lives. Under farm conditions, the dominant individuals are “feeders” and continue to grow whereas subordinates become “non feeders” and show signs of stress such as gastric ulcers, and there are frequent confrontations between them. The extent to which migratory species such as salmon suffer from confinement in sea cages, and to which solitary species such as halibut suffer from crowding, are questions that need to be addressed. It has been suggested that Atlantic cod may be more suitable for husbandry than Atlantic salmon since it may be less easily stressed. Animal welfare groups have argued for a moratorium on the introduction of new species into fish farming before humane rearing, transport and slaughter methods have been developed for that species. The farming of carnivorous species, such as salmon and trout, has also attracted controversy on account of their requirement to consume, as feed, more fish (in the form of fish oil and fishmeal) than they produce. In the EU, fish are included in the minimum standards for the protection of animals bred or kept for farming purposes, as laid down in Council Directive 98/58/EC but these contain no detail on permissible rearing conditions such as stocking density or enrichment. 1. Gregory N.G. (1998) Animal welfare and meat science. In: chapter 11. CAB International, November 1998. ISBN-13: 9780851992969. 2. Scientific Opinion of the Panel on Animal Health and Welfare on a request from the European Commission on animal welfare aspects of husbandry systems for farmed fish: carp. The EFSA Journal (2008) 843, 1-28. http://www.efsa.europa.eu/en/efsajournal/pub/843.htm. 3. Closed waters: the welfare of farmed Atlantic salmon, rainbow trout, Atlantic cod & Atlantic halibut. Compassion in World Farming, Surrey, UK and the World Society for the Protection of Animals, London, UK. http://www.ciwf.org.uk/includes/documents/cm_docs/2008/c/closed_waters_welfare_of_farmed_atlantic_salmon.pdf. 4. An HSUS Report: The Welfare of Animals in the Aquaculture Industry. The Humane Society of the United States. 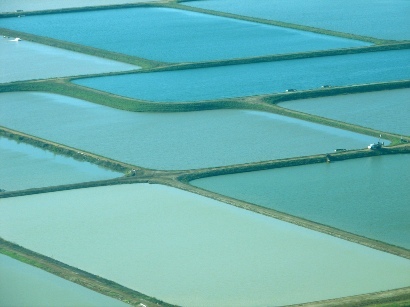 http://www.humanesociety.org/assets/pdfs/farm/hsus-the-welfare-of-animals-in-the-aquaculture-industry-1.pdf. 5. Maurer, A., 2007. Preventing the Catfish Blues. Tech Journal South, March 15. 6. Soil Association, 2011. Soil Association organic standards aquaculture. Revision 16.4 June 2011.http://www.soilassociation.org/organicstandards.